AN eight-year-old boy with leukaemia is battling an infection in hospital – the latest challenge in his family’s fight to save his life. 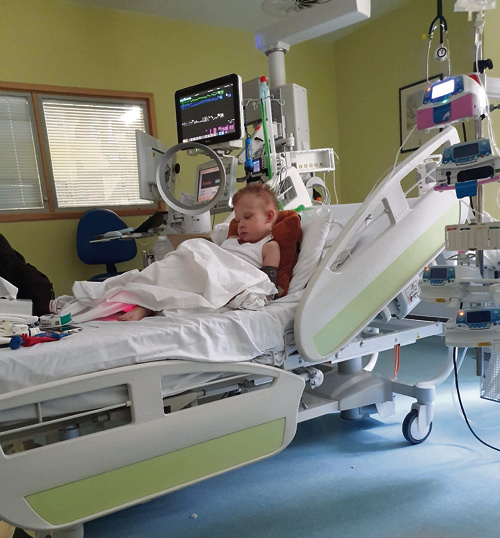 The Voice has previously reported how Lee Belgium’s family are trying to raise £90,000 for a treatment trial and bone marrow transplant not available on the NHS. Lee, of Lyde Green, was first diagnosed with acute lymphoblastic leukaemia in May 2016 when he was just six. He underwent intensive chemotherapy and spent six months in hospital and despite being clear for almost a year, his family were given the devastating news in August last year that cancer had returned in his bone marrow. Lee goes to Bristol Children’s Hospital three times a week to have chemotherapy, steroids and a new trial drug. But the family is also trying to raise £90,000 for Lee to go abroad for a treatment trial and a bone marrow transplant they hope will save his life. Bristol Children’s Hospital has changed Lee’s chemotherapy to a higher dose of cyclophosphamide and cytarabine and, so far, he has responded well to the treatment and is currently cancer-free in his brain. But Lee’s mum Clare says Lee then came down with a bacterial infection called klebsiella pneumoniae, which nearly killed him. Lee has a bone marrow test in a few weeks, and if the cancer is better the hospital have said that they would take the results to the board to see if they can do a bone marrow transplant. However, if this isn’t possible then a hospital in Turkey has said that they are able to treat him, and Clare will travel with Lee for treatment. The family’s fundraising campaign is continuing and a charity football match at Ashton Gate Stadium is planned for Thursday May 9, and a team from Marston’s Pubs and Bars will cycle from Banks Brewery in Wolverhampton to Thornbury on Tuesday May 21, with a target of raising £10,000.